Hello, Azure friends! If you manage Azure resources, you’re probably already familiar with the Azure portal. In this blog post, I’d like to highlight some of the experiences and capabilities that you can take advantage of to get the most out of your Azure portal experience. Getting to your resources in a fast and convenient way is key for productivity. The Azure portal provides a search functionality, always present in the top navigation bar, that allows you to search across your resources, resource groups, available services, and public Azure documentation. When the search box gets the focus, it immediately provides access to your recently used resources. As you type a search string, it searches for matches in your list of resources (e.g. virtual machines, databases, app services, etc. 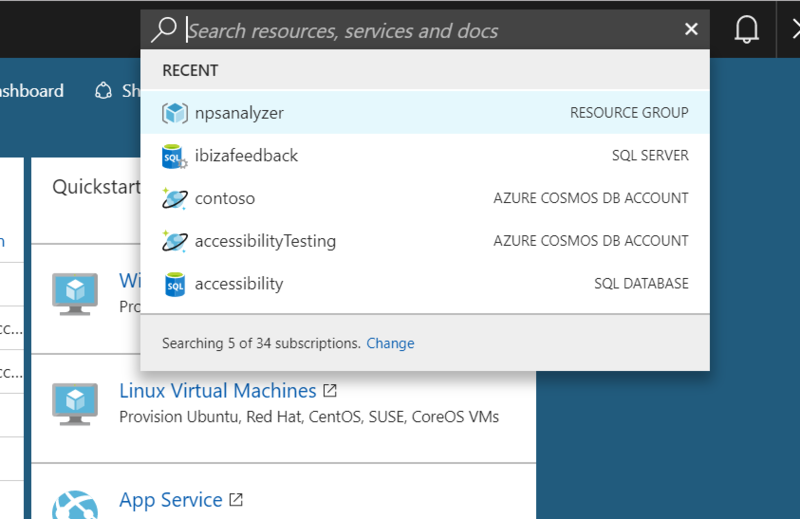 ), resource groups, services available in Azure, and documentation. Notice that the search above is performed across multiple subscriptions (in this case across all my 34 subscriptions). This is a configurable setting, so you are in full control of the scope of your search. The search box is always present in the top navigation bar. You can also get to it using the key combination “G” + “/” and jump to any point of interest using just the keyboard! Want to start multiple virtual machines at once? The list of resources provides the ability to either act on one or multiple resources. The animation below shows the following scenario: I have created a few testing VMs and need to start to run some tests. I can start them with a single and quick interaction. Tags allow you to annotate your resources with information that you can later use to organize those resources logically. Tags also show up on your billing data so you can use them for both resource and cost management. We are improving the tagging experience and now you can tag, or untag, multiple resources with a single interaction, as shown in the image below. Azure offers a wide range of services, and learning the fundamentals on how to do basic management on everything can be scary. The Azure portal provides a consistent experience that covers finding an instance of a resource, covered at the beginning of this post, to performing basic management operations. The image below highlights some of the common patterns using the Virtual Machine overview screen as an example. Management landing pages for most resources contain the same structure and basic elements, so once you learn a few patterns, you can apply them across most of the portal. The image below shows the overview pages for App Service, Virtual Machine, and SQL. Notice that all screens follow the structure introduced in the previous image. 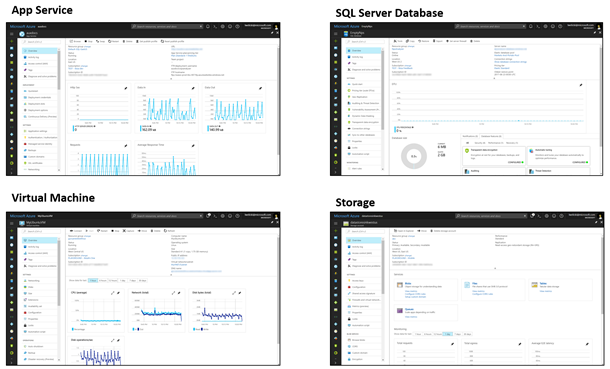 The Azure portal dashboard is a canvas that you can make your own. It is fully customizable, and you can change it to bring what is important to you front and center. 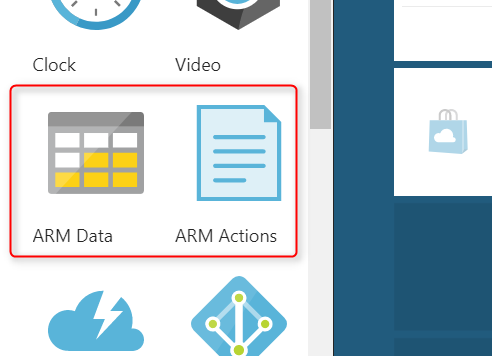 The ARM Data allows you to display data from any of your resources in Azure Resource Manager. Just add an instance of the tile to your dashboard, point it to a resource URI, and navigate to the property that you want to display. The ARM Actions is similar, but for actions on resources. 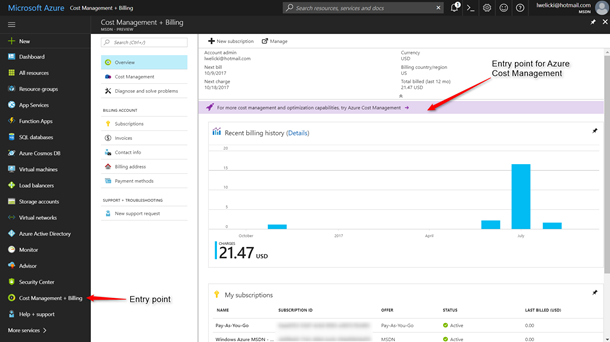 If it is in Azure Resource Manager, it can be in your dashboard! You can manage your account using a point and click GUI or via a command-line experience using Cloud Shell (Bash or PowerShell). Cloud Shell provides an authenticated, browser-based shell experience hosted on the cloud and accessible from virtually anywhere embedded in the portal, and is always one click away. As you progress in your Azure journey, it is very likely that you will use Azure Resource Manager templates. 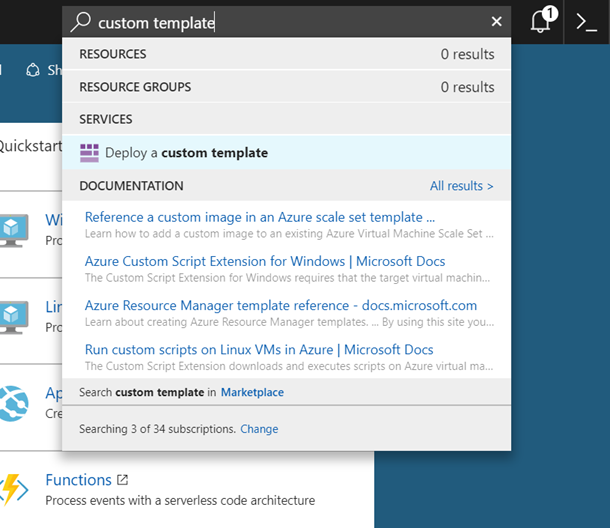 You can create your template from scratch or use/extend one of the more than 600 templates available in the Azure Quickstart Templates gallery. 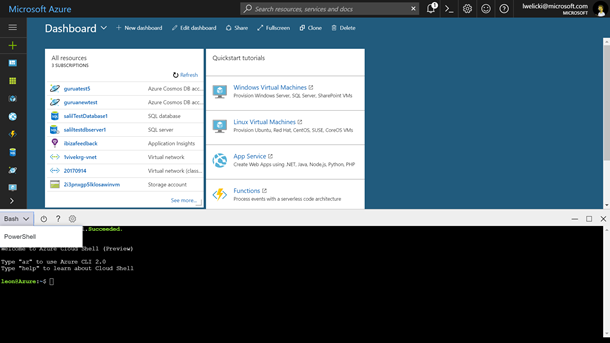 This experience is fully integrated with the Azure Quickstart Templates gallery, so you can load any template from the gallery. Once you find a template that fits your needs you can edit it using Template Editor screen that provides a full outline of the template, syntax coloring, and helpers to easily add new resource instances into the template, or execute the template. If you decide to execute the template, the portal will provide a data entry screen with specialized fields and validations to reduce data input errors. In addition to what we have already shown above, the portal provides a template library that you can use to store your own templates. Building cloud applications is a hard task, and making the most out of the platform is even harder. Azure Advisor helps you make the most out of Azure by providing recommendations for improving cost, availability, security, and performance. Azure Advisor is available by default in the left navigation bar. 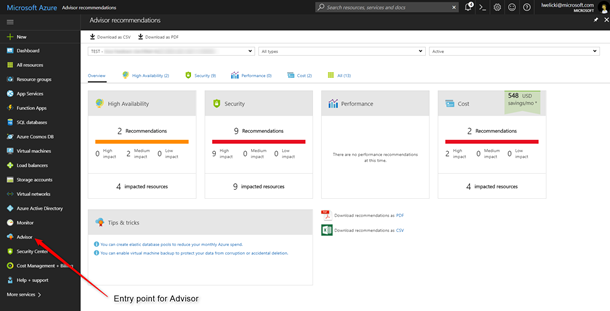 Once you get to Azure Advisor, you can select the subscriptions the platform will provide the best recommendations to help you optimize your applications and infrastructure. 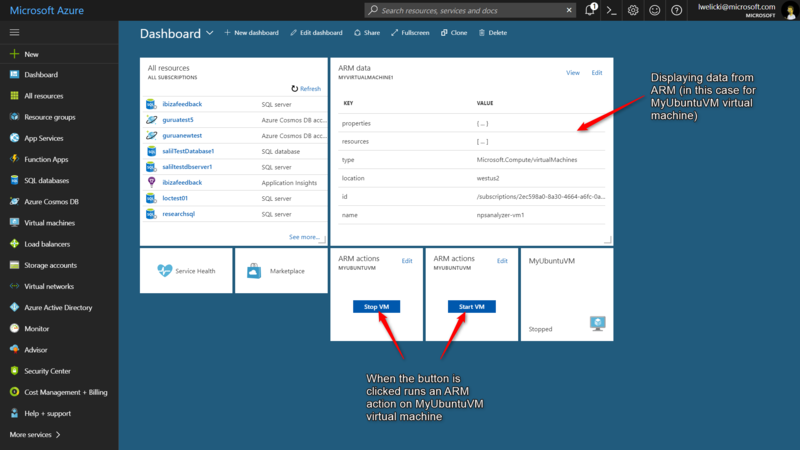 Start using Azure Advisor today and make the most out of Azure! Azure Monitor provides base level infrastructure metrics and logs for most services in Microsoft Azure. It is available by default in the left navigation bar, so being on top of your infrastructure and applications is just one click away! Notice that the Azure Monitor screen above follows the same UX patterns that we introduced previously in this blog post when discussing about “Consistent management experience”. 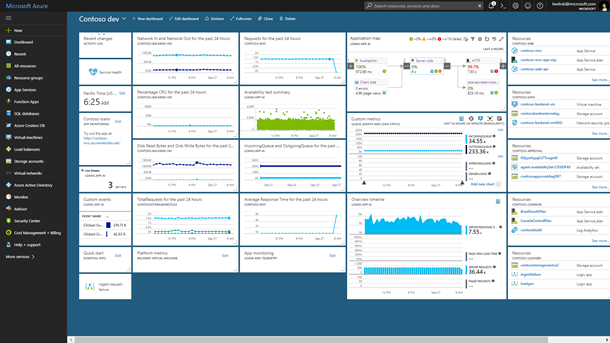 Learn more about the latest on Azure Monitor. With the Azure portal you are always one click away from being able to see and understand what are you being charged for. The default left navigation bar has an entry that takes you to the “Cost Management + Billing” screen. Try Azure Cost Management. We’d love to hear your feedback. 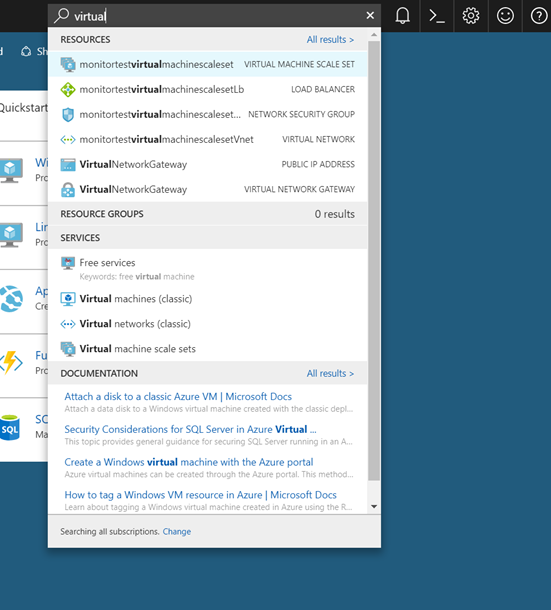 Take Azure with you, everywhere! 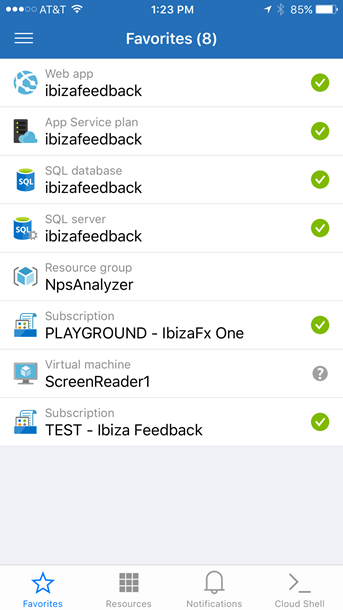 The Azure mobile app enables you to stay informed, connected, and in control of your Azure resources and applications. Learn more about the Azure mobile app. Download the Azure mobile app today and let us know what do you think! In Azure portal preview we often deploy some features in early stages. If you want to try those new features, please use the preview stamp and let us know what you think as your feedback will help to improve those features! 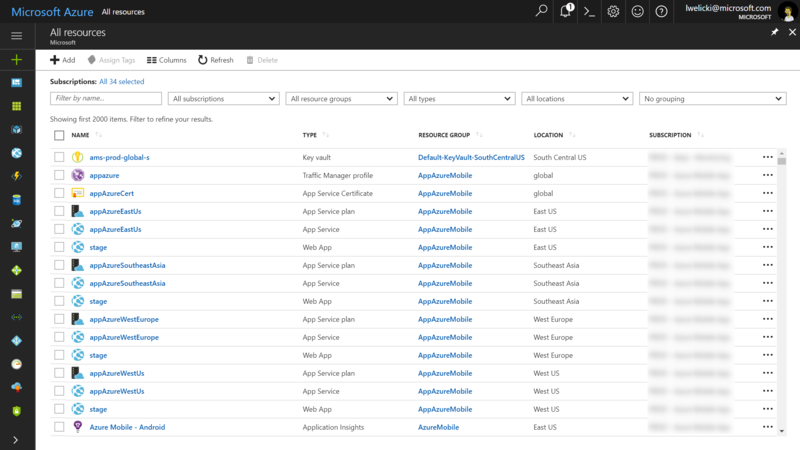 We’ve gone through a lot of stuff and still did not cover everything available in the Azure portal! The team is always hard at work focusing on improving the experience and is always eager to get your feedback and learn how can we make your experience better. Feel free to reach out directly to me at lwelicki@microsoft.com with your feedback or any thoughts about Azure user experience. Let’s build together the best cloud experience!